Although Larry went solo on his scheduled reptile collecting trip to Australia in September of 1958, Nancy Jane typically ventured out together on expeditions like the following year’s trek to South America including Trinidad and what was then British Guiana. Upon their return, they made a presentation at the Toledo Zoo. The event’s popularity generated great interest and the following year The Toledo Blade newspaper sponsored a safari to the same areas. 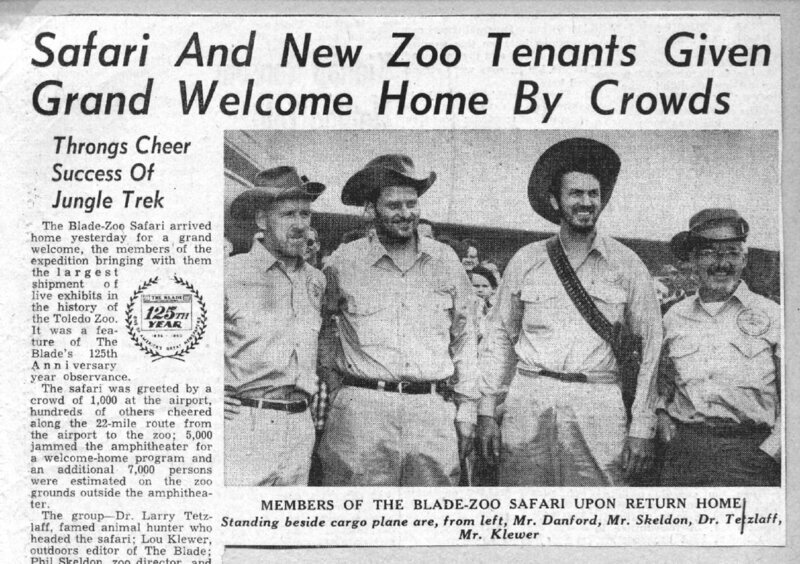 Along with Larry, the safari included Toledo Zoo Director Phil Skeldon, Curator of Mammals Danny Danford, and Toledo Blade Sports Editor Lew Klewer. Their return was greeted by 1,000 at the airport as well as hundreds lining the road from the airport to the zoo and, according to the newspaper, some twelve-thousand visitors filled Toledo Zoo for the welcome home program. The next year, Larry and Nancy made a photo safari across Mexico from the Pacific to Gulf side finishing at the ruins in the Yucatan peninsula. 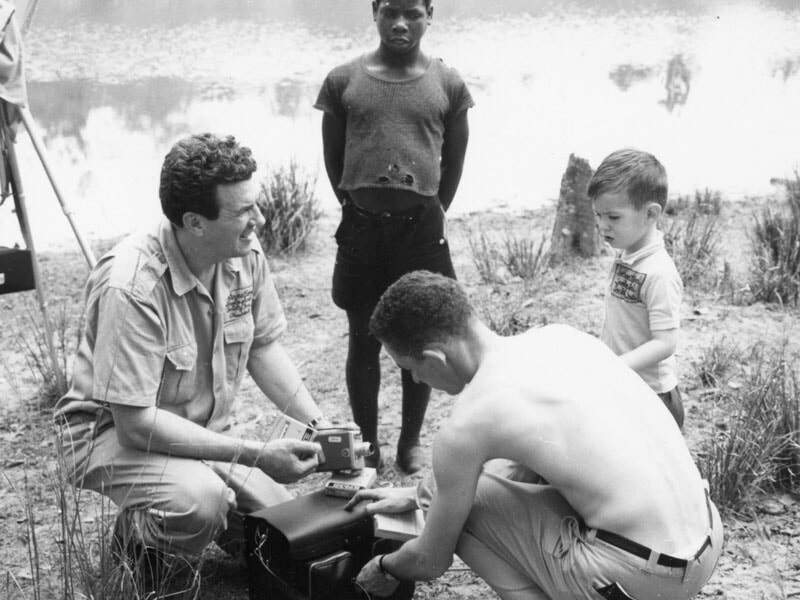 Then in 1966, Larry and Nancy and young son David set out into the West African country of Liberia to collect and film animals. Their conservation ethic and caring style on these trips was often a surprise to guides who had worked with other safaris. On one expedition, guides were ready to chop down an entire tree filled with bird nests. Larry stopped them and climbed the tree personally to retrieve just six of the nests. Their 1960s program, The Vanishing Everglades, highlighted their concern for domestic conservation as well. A promotional flyer for the Tetzlaffs' "Vanishing Everglades" program in the 1960s. In 1967, the Tetzlaffs took a break from international travel and began seeking out a warm winter location so their animals could be outside all year. In 1969, the Tetzlaffs began leasing Caribbean Gardens in Naples, Florida from the estate of Julius Fleischmann of Fleischmann Yeast fame. The Florida attraction was renamed Jungle Larry's African Safari and remained open year round while a portion of the animals spent summers at Cedar Point. Larry set out on safari again in 1972. 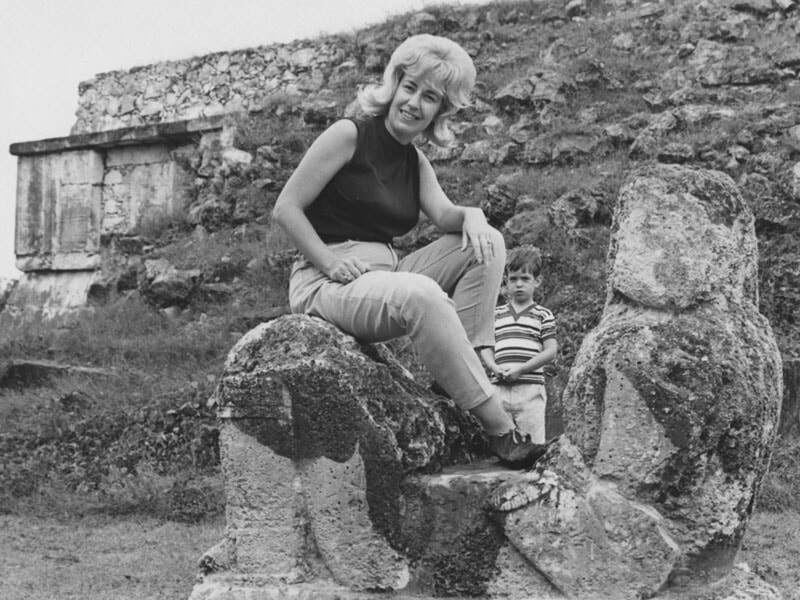 Nancy stayed in the U.S. with their youngest son Tim due to contractual obligations with Cedar Point while Larry and eldest son David guided a tour through East Africa. In addition to traversing Kenya and Tanzania, they were also one of the last safaris to go through Uganda before Idi Amin plunged the country into years of strife. 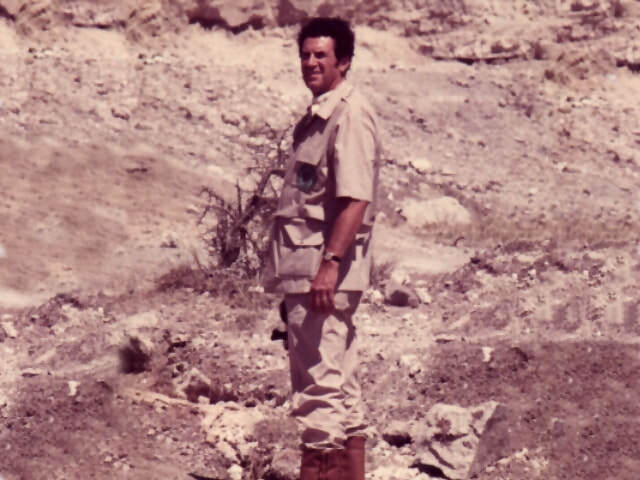 Larry at Olduvai Gorge in Tanzania on his final African safari in 1972. 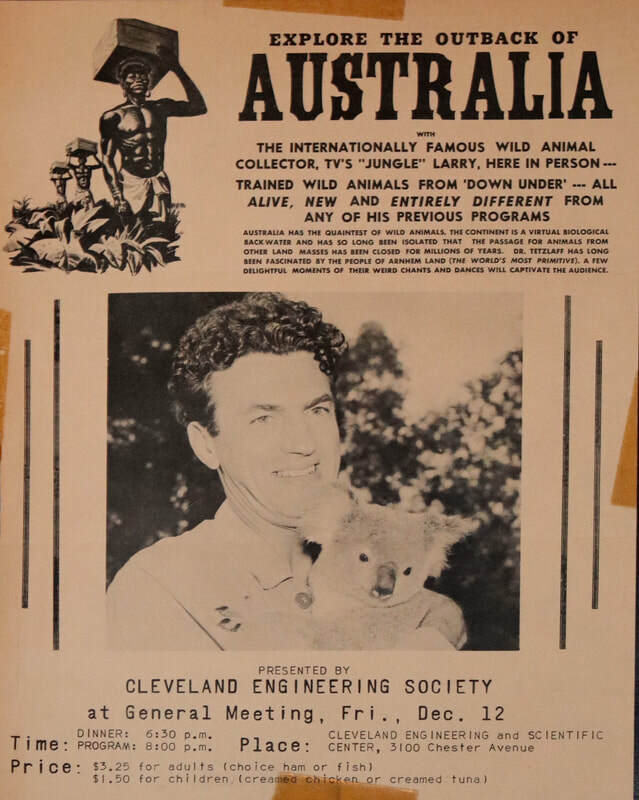 One of the flyers for Larry's presentation following his trip to Australia. Nancy in South America with a piranha she had just caught. Article in the Toledo Blade following the Blade-Zoo safari led by Larry. 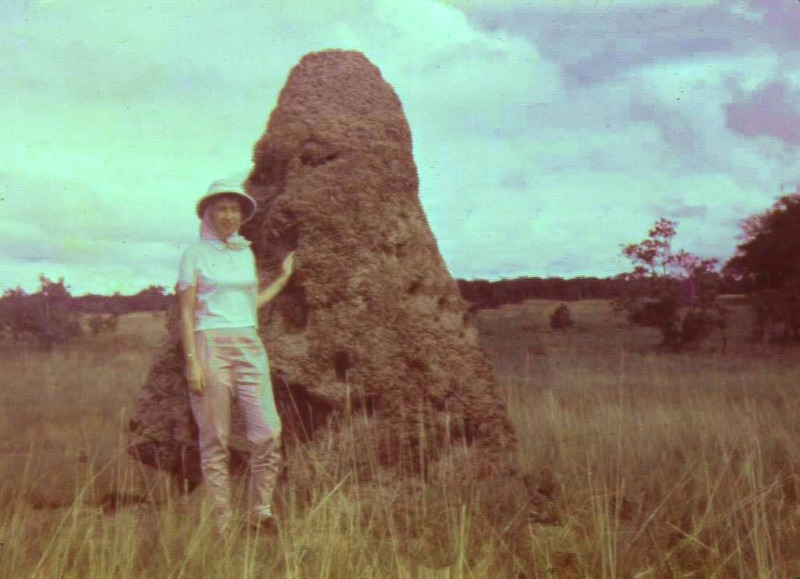 Nancy standing by a termite mound in what was then British Guiana.